For our overseas readers who may not have heard of the TV programme TOWIE, I shall enlighten you. It is a TV series which is a docu-soap about the up and coming young people of Essex (The Only Way Is Essex). We have never seen any of it but it gets a fair amount of ridicule for the vanity and post-lobotomy nature of the stars. What a sorry way to portray what overall is a beautiful county and the people. Even though Jon was born on the London/Essex border I feel that we have only ever passed through. 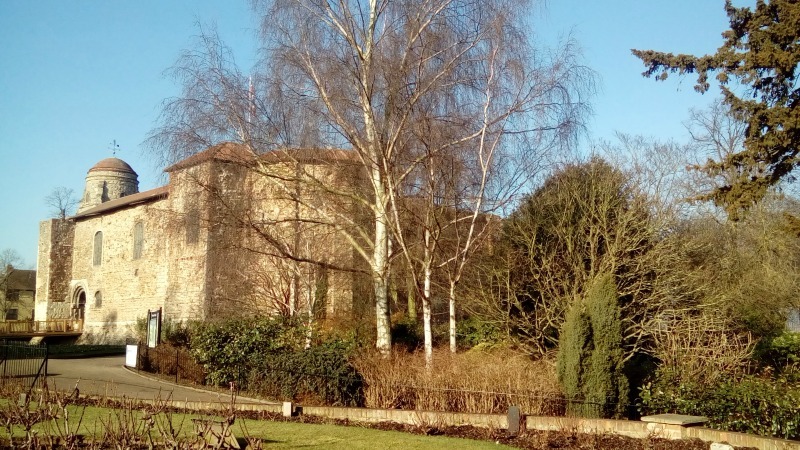 Overnight stays near Halstead, a family party in Billericay, a day trip to Southend and a funeral on the outskirts of Colchester is about the extent of it. 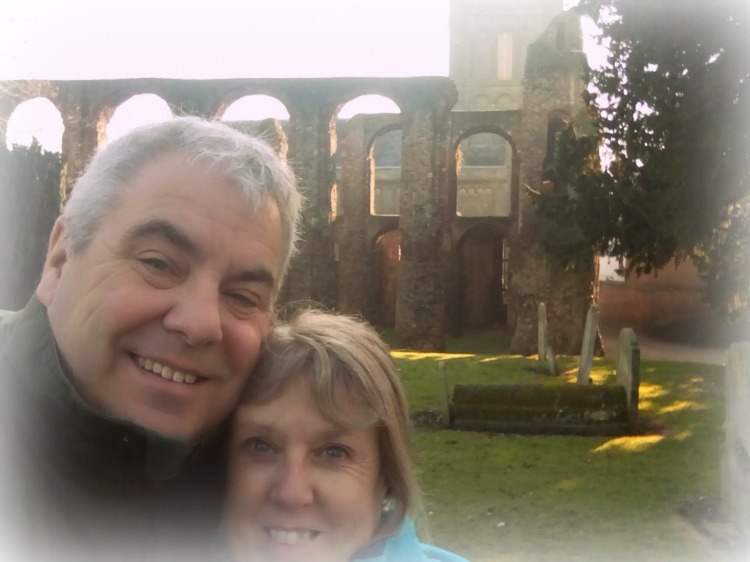 We had a two night stay arranged in the Colchester city centre before we would be meeting up with our house sit hosts. 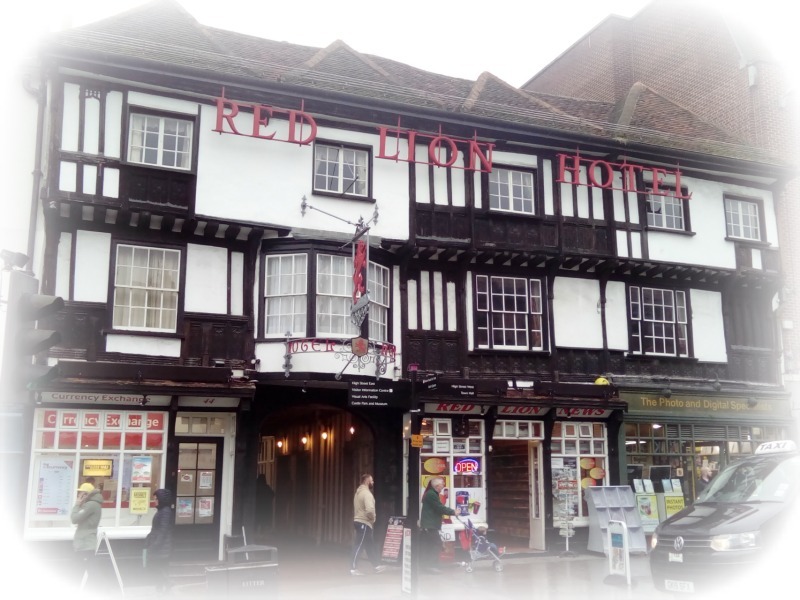 A quick look on booking.com brought up the Brook Red Lion, a Tudor hotel. 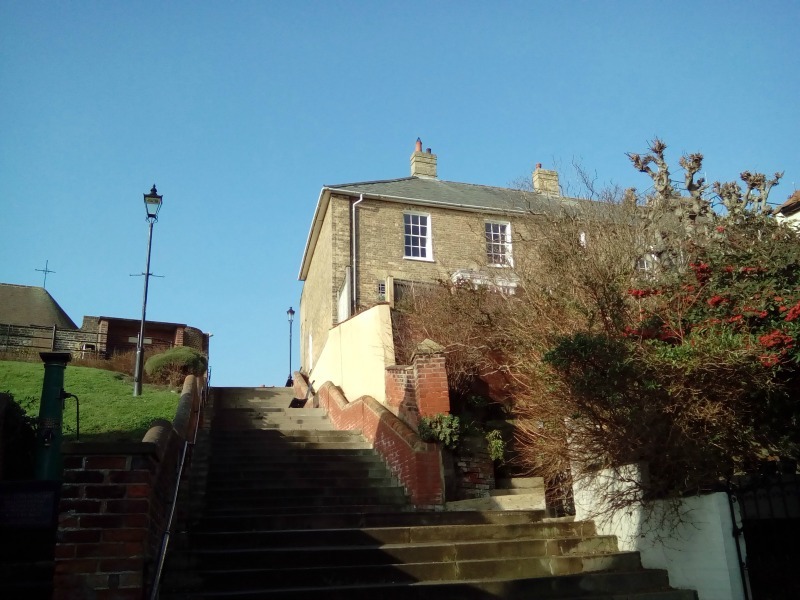 It is a Grade 1 listed building dating back to 1485 and has no less than three ghosts roaming the premises. A young women who was murdered in the hotel back in the 1600s, a hooded monk and a young boy. The hotel itself was a bit tired but certain rooms, especially the Parliament Restaurant, felt like you were stepping back in time and was allegedly where Oliver Cromwell held his first Parliamentary meeting. From the speed of service in the restaurant, I think they were still fetching water from the city well and cooking over an open fire but it was good when it arrived. To be honest though we loved our meal in the restaurant where we were served(?) by a very stressed lady who constantly got orders wrong and forgot what had been asked for. She also didn’t really get the concept of all the customers being able to hear her shouting as soon as she walked through the adjoining kitchen door. So ‘they wanted cheese on them garlic breads’ and ‘you got those prawns ready’ just cracked us up. The Red Lion Hotel also took us back to our time in the USA, especially Washington DC. Why? Well it was so hot in the States in the summer that we were sleeping ‘au naturel’ with no covers on. Same in Colchester. They had the heating fixed so high that we had our window open fully and slept as God intended! Brilliant. No ghost activity to report overnight so we felt ready to explore. We followed our usual plan and headed for the Visitor Information office. It seemed a while since I had a leaflet splurge and I wasn’t disappointed. 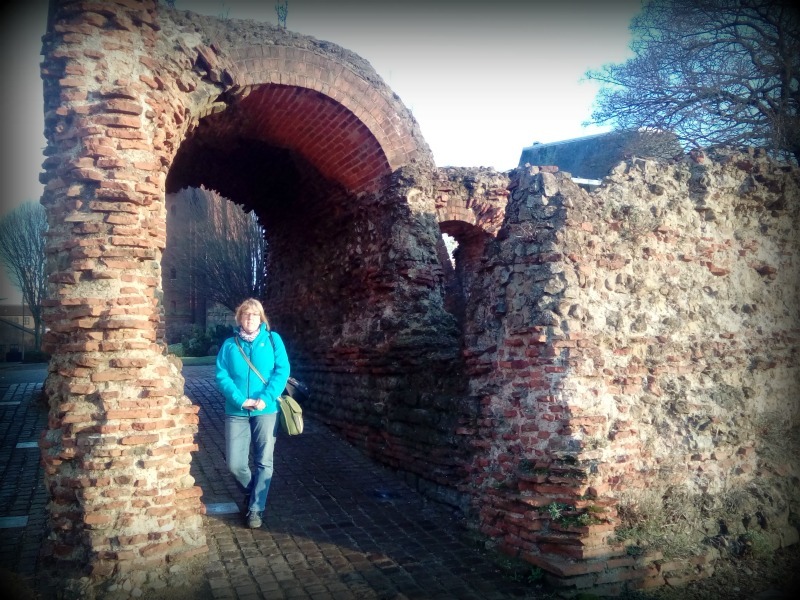 It was an icy crisp morning with beautiful blue skies so we decided to do a lap around the Castle gardens first, walk along the river and see a bit more of the fairly in tact Roman walls to the original city. Yes Roman! 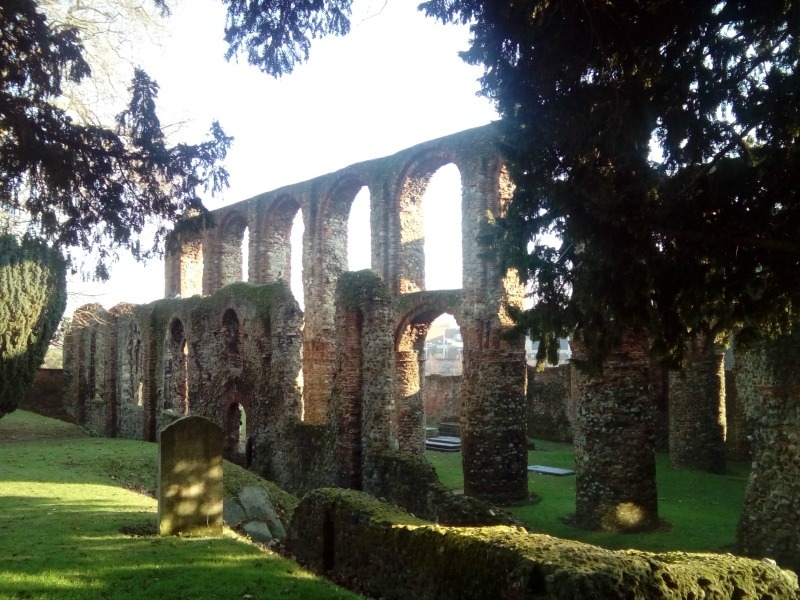 As you know, I like a bit of history and even I was amazed to read that Colchester was the first Roman settlement in Britain and the oldest recorded town. It was referred to in AD 77 as Camulodunon. The current castle is built on the foundations of a Roman temple from AD 54-60. It is open to the public and you can view the foundations if you take a tour. Not a clown or trapeze act in sight! Or a Roman Circus for that matter. We had seen on the town map that the remains of a Roman Circus for chariot racing had been discovered. We did view a few stone remains and a visitor centre which was closed for the winter so can’t tell you much more about that. On the way there we walked through the remains of a couple of Roman gateways to the city. One of which, the Balkerne Gate, has The Hole in the Wall pub built on top of it. This part of town is dominated by a huge 35 metre water town. It was nicknamed Jumbo after the elephant by the local reverend whose rectory it dwarfed and now has a elephant weather vane on top of it. It was completed in 1883 and taken out of use in the late 1980s. 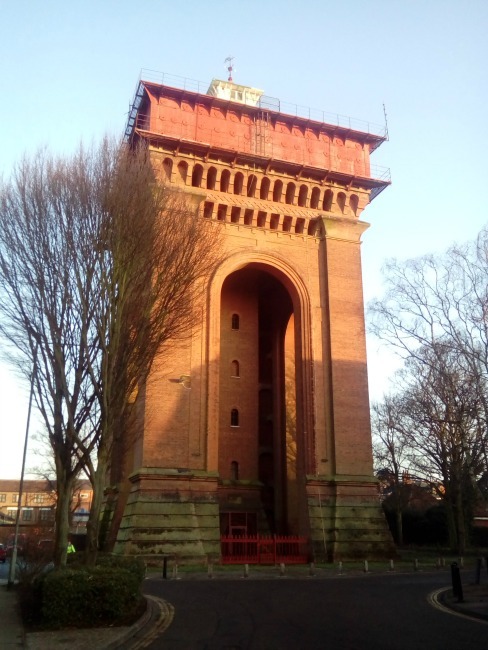 It has changed handed many times and various planning applications have been submitted to convert it into a penthouse residence but to date Jumbo is still a water tower. Maybe a future Airbnb listing? We had seen the ruins of this from the train as we arrived. 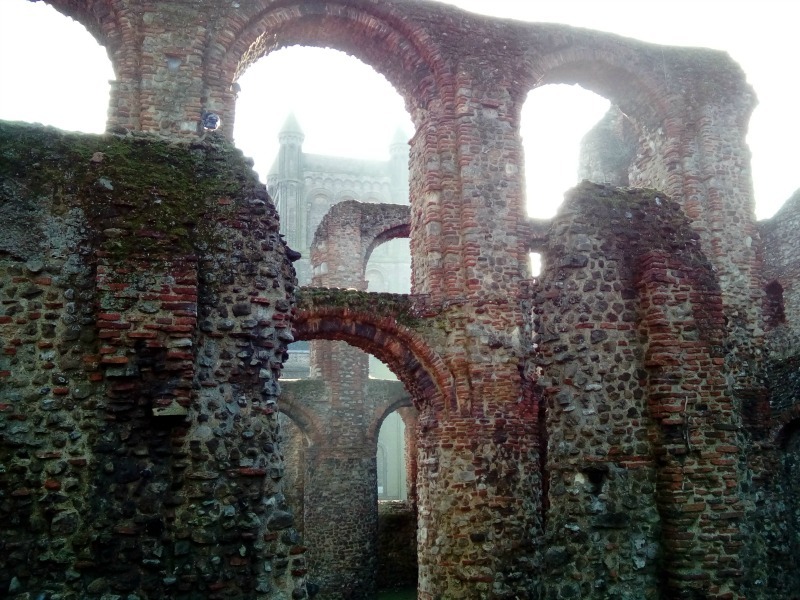 Huge flint and Roman brick arches supported by massive circular pillars are all that remain of the original knave of the priory founded in 1100. It is operated by English Heritage but unfortunately the grounds seem to serve as a cut through from the town to the station. What would St Bardolph make of that? Maybe his ghost is the hooded monk in the hotel berating visitors. What a pleasant surprise Colchester was to both of us. Definitely overlooked but a great place to explore for a half day or more on the way to the coast. All too soon it was time to meet up with the owners of Ed, the English Pointer, and travel to their holiday home in Aldeburgh on the Suffolk coast where we will be house sitting for around a month. We were met by Simon and the hour journey whizzed by. Instantly gone are those few moments of apprehension when you wonder a) if they will turn up; and b) will we get on. We arrived in Aldeburgh to meet Mary and, of course, Ed who were all very welcoming. Looks like Jwalking 2.5 Assignment 3 is going to be a good one! Would we ever have come to Colchester or Aldeburgh if it wasn’t for a house sit? Aldeburgh possibly but Colchester probably not which is what is so great about this house sitting adventure – it takes us to places we never intended to visit so we can explore and hear all about the travels of the house owners we are sitting for. Essex does get a bad press, which is a shame as it has a lot to offer. Of course, offerings such as TOWIE don’t help its cause at all! Totally agree….. but must dash and get my teeth whitened (not). Welcome back Jo. Once again more history than you can shake a stick at! As you may recall I am an Essex man but I don’t think I have ever been to Colchester. Essex does get a bad press and hailing from Basildon I know why! In the future can we have less talk of ‘au naturel’ please? Good luck with what is quite obviously a German short haired pointer!